A few years ago my daughter was really into horses. She had a ton of My Little Ponies as many little girls do. About six months before her birthday, I was so excited to find the Fur Real pony on sale for 50% off after Christmas. Luckily we were at grandmas house at the time, and she was willing to keep it hidden at her house until Kara's summer birthday. Knowing that she was going to get the pony for her birthday, I talked her into a horse/western themed party. I scheduled her party for 2 weeks after her actual birthday, because we were going to be on vacation in Branson, Mo for the big day. She was shocked and thrilled to come back to the cabin one day and find Butterscotch waiting for her. When everyone arrived for the party, we gave out cowgirl/cowboy hats, bandanas and sherrif badges. Each child then had the chance to pose with Butterscotch the pony. I had made a cardboard corral out of a large piece of cardboard, but we had to keep the pony and corral inside due to high winds and the threat of rain. I dont have many pictures of the decorations. I wish I did, but at the time of this party I had no idea I was going to have a pary idea blog. =) I know I found checkered tablecloths at the dollar store that I used on the main table and in the craft area. I also used streamers, balloons and horse banners as decor. We played several horse/western themed games. In this picture my older daughter is showing how to run the pony race. We had two horse sticks, and used them to run relay races. The girls loved trotting around the yard, and it was a good way to get some energy out. In this picture we are panning for gold in the sandbox. I found a couple bags of fake gold coins, and hid them in the sand. Each child took turns panning for gold, and then they were able to keep their coins. While we did not have a Trading Post at my daugthers party, I really like the idea from Special Interest Day where the kids exchanged the gold they found for treats. This would be a good activity for this type of party because the kids would enjoy choosing their own prizes. We also played a game called lasso the pony. I made a pony head out of foam board and paint. To make the lasso, I wrapped a dollar store hula hoop with rope. Once they got the lasso moving they tried to catch the wild pony. YeeHaw! Look at that lasso go. 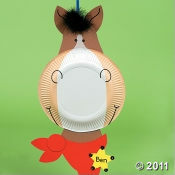 Oriental Trading has this really fun paper plate horse craft kit. 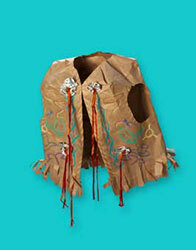 Other craft ideas could be to decorate horseshoes, pony coloring sheets or paper bag puppets. I made her cowgirl boot cake by cutting a sheet cake using a template I drew myself. I know the M & Ms and candles have an interesting look to them, but that is what happens when you allow a 6 yr old to decorate her own cake. Smores would be another great option for this type of party. After opening presents the kids took home goody bags filled with horse stickers, horse themed candy, horse finger puppets, and their gold coins. They also kept their cowgirl/cowboy hats, bandanas and sherrif badges. Kara still has her Butterscotch pony and loves it to this day. I have linked this party to several AWESOME websites. Please make sure to check out my Link Party page and give them a visit. Also make sure to check out Get Your Craft On at Todays Creative. Love the vest, and the boot cake is adorable! what fun! Such a great gift too. I'm sure she loved it. I am becoming a big fan of your parties, they are so well thought out! And well, I love to throw a great party (my husband always says overboard)so these are so helpful! Thanks for sharing another fantastic idea, hope to see you again Friday! I am having fun checking out everyones links. Veronica.. you did an awesome job on that cake! I seriously want to go to one of your parties. Holy cow you thought of everything!! Awesome job and what wonderful memories you made for your daughter!! Oh I forgot...thanks so much for coming back and linking up to Strictly Homemade Tuesday Linky party!!! Great party! I made a boot cake for a western theme birthday, too! I'm so glad you linked it to the Tuesday To Do party! Can't wait to see what lovely you post next! This is just too cute! How lucky to get that horse too! Thanks for linking up!